If you caught my video on New Year’s resolutions, you’ll know walking more is at the top of my list! Except for the days we are shooting outfits, I’m sitting at my desk for the majority of the day. I really only get up when walking to the bathroom, grabbing a packing from downstairs or walking upstairs to shower after a workout or get ready for bed. After seeing the steps we walked daily in Asia and while I was in London (upwards of 20K and sometimes even over 25,000 steps every day), coming back to 1,000 steps a day is pretty depressing. I think all that walking abroad is what allowed me to splurge on food more often and enjoy all of the food those countries had to offer! I didn’t gain any weight on that trip, and I have to assume it’s because of all the extra cardio I was doing on a day-to-day basis! So with that, I decided one of my resolutions for 2017 was to walk more. Unfortunately things have sort of been crazy busy lately so I’m not walking as much as I’d like, but I am now walking 2-3 times a week on top of FlyWheel and BBG. Better than nothing, right? Up until this point, I’ve taken a walk after Emily leaves at 2pm for an hour before heading back to my computer. It’s been the perfect break to stretch my legs, enjoy some fresh air and clear my mind! I usually trek over to my new house for my walk, since it’s about a 1.5 mile walk on the way there and back – I walk about 8,000 steps doing the round trip. It kills two birds with one stone, because I can check on the progress with the builders and take photos! 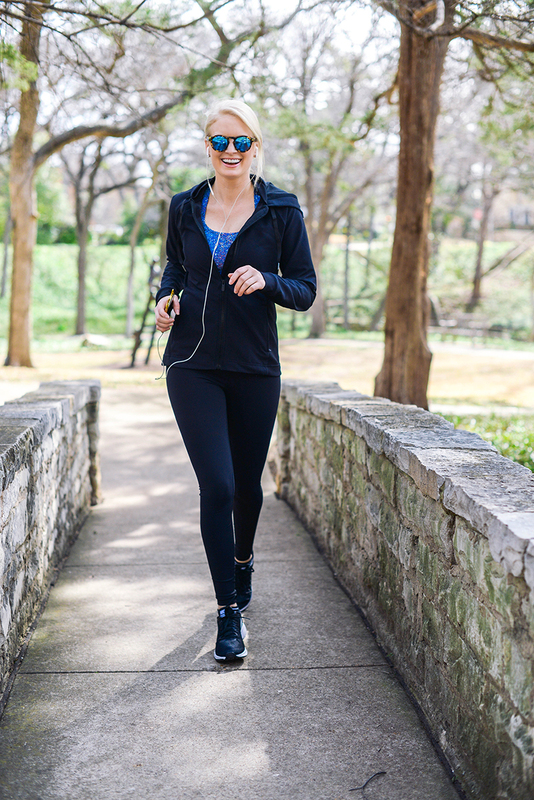 This Lululemon jacket has been the ideal topper for the brisk walks – it’s not as tight as some of their other jackets because it’s meant to be a to-and-from style (versus one you go on runs in), so it’s more comfortable and less restrictive. Even after a big lunch! I love the zippered pockets too. 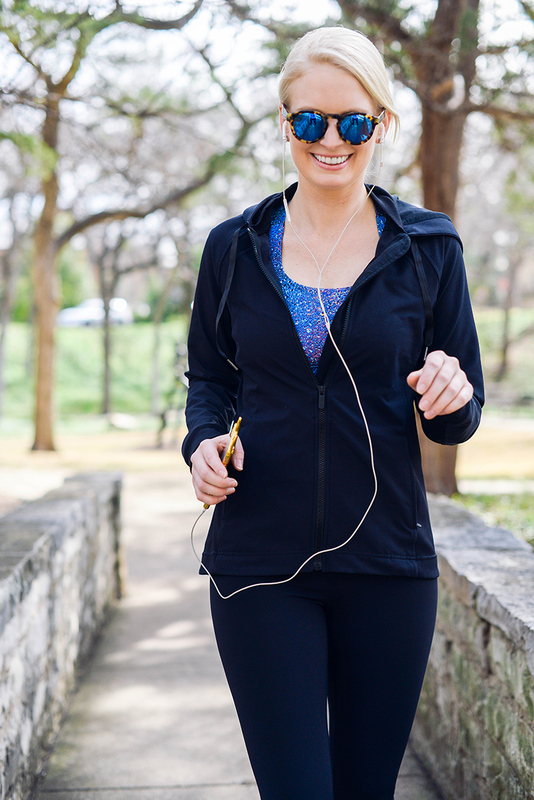 It’s a great everyday jacket to throw over your workout clothes for errands and stuff! Socks are often taken for granted, but they are SO important to your workout. I really only have two pairs that I love and use on a regular basis: Balega Hidden Comfort and Nike’s DryFit No-Show Socks. Both are very comfortable, stay put and keep your feet dry and protected during your workout. After a particularly muddy visit to the new house, I had to designate the shoes I wore that day to all future visits. They got completely covered! Thus, they are now removed from the rotation for BBG, runs, errands, etc. I decided to invest in two new pairs to spice things up! I picked up this basic black +white pair and this wild watercolor sneaker (in black/white/racer blue). Is it just me or do bright colors motivate you a little more? Surprisingly they go with all of my leggings and tees I use to work out. Love! In addition to the fun, colorful sneakers, I picked up this printed sports bra (in strive multi black) for wearing under my favorite Lululemon tees. This bra holds everything in place, but is a little less intense than my Juno bra that I wear for FlyWheel. It’s not bulky, lies flat and is flattering. Plus, the color scheme is so pretty! I also got it in black. Speaking of my favorite tees, I also picked up the long-sleeve version of it that I’ve been wearing for days when it’s too hot for a jacket, but not warm enough for a tee alone. Love the finger holes and the comfy fabric! Last but not least, I finally decided to order a Lululemon headband. I have the most annoying fly-aways that constantly get in my face when doing BBG and FlyWheel, and this headband is the only thing able to tame them. Of all the headbands I’ve tried, this is the only one that has stayed put on me! It’s not too tight, but somehow it doesn’t move – best of both worlds! I’ve been trying to add more fitness into my schedule as well. I love that you are adding walking while still heading to the gym! I love walking. It suits me much better than running. Go on! I’m so glad to find a fellow Balega Hidden Comfort fan. I was talked in to a pair at a Canyon Ranch “gait and footwear analysis” and have found they are the most comfortable and well made socks I’ve ever had. I was pleased to find out good things about the company too–environmental and human rights responsibility is in check. Happy walking! You look awesome! Please write more posts about BBG and what your experience has been like! It seems to be working well for you- I am on the second week and I hope I see results as good as yours! How long did it take you for to start seeing results and what has your diet been like? Also, are the Nike pegasus sneakers comfortable? 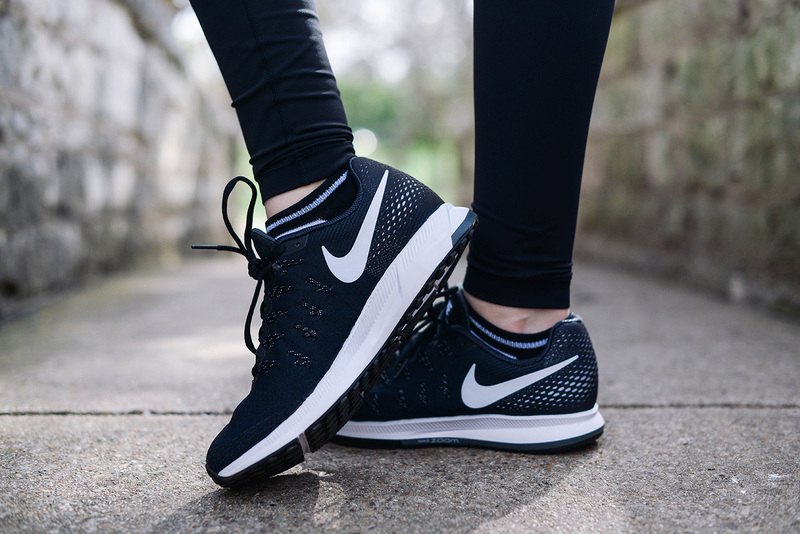 I’m looking for a new pair of running/workout sneakers and those are one of the pairs I have been looking at.